Anyone with coarse, curly hair that needs the extra help with lifting hair from potential ingrown position. Directions USE DAILY. Dead skin builds up on a daily basis. Fight back daily to keep skin ready for ANY type of hair removal. 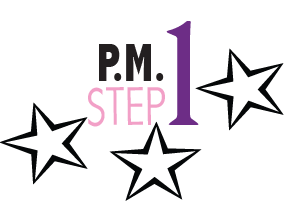 10 Seconds to spray target areas PRE-BED for overnight exfoliation of dead skin. Used on target areas of the face and body, this dynamic duo will eliminate and prevent ingrowns, rash and irritation from any type of hair removal. Reduce inflammation and clear pores with this amazingly light, yet deeply hydrating lotion. Willow Bark treats. Neem heals and Aloe soothes. Anyone with freshly waxed, shaved or tattooed skin. It's the perfect cooling, soothing, treatment hydration. Perfect for daily treatment for oily, acne prone skin. Real organic Aloe, Coconut, Jojoba and Vitamin E to hydrate and heal. Treatment benefits of true Witch Hazel extract and Willow Bark reduce inflammation and clear pores for happy, clear skin. Neem oil and Rosemary strengthen skin, making it less reactive and more able to withstand the punishments of daily life! This non-greasy, light weight lotion can be use head to toe. Use post wax or shave in delicate areas to calm, sooth and hydrate - the holy trifecta of care for eliminating and preventing ingrown hair and rash reactions. For acne prone skin this is the perfect hydration plus treatment to help skin heal and reduce inflammation and breakout. Never harsh, never smelly, never sticky! Shavers or Waxers will benefit from the enzymatic exfoliation of fruit and sugar acids that will break the bond of dead skin that will clog up any hair removal treatment. Willowbark, a Beta Hydroxy keeps pores clear while Aloe hydrates. A fine mist sprayer of natural Aloe base and optimal Fruit & Sugar acids for gentle yet effective exfoliation. Alpha Hydroxy Acids for surface, water-based exfoliation of Bilberry, Maple, Magic, Lactic, Glycolic. Along with Willowbark a Beta-Hydroxy (oil clearing exfoliation) for in pore exfoliation. All of this magic is in a liquid Aloe base for deep, soothing hydration so skin can heal itself and stay strong. Spray everyday for smooth, enzymatically exfoliated skin. Use once a day, just before bed, for best results. Can be used twice a day to eliminate ingrowns or rash. The perfect way to save some cash on the items in your Bikini Kitty Shave Kit that will go the quickest. Replenishment for shavers when you find that man in the house has used up all your product! We offer a Wheat/Gluten FREE version of our shave gel in this kit. Specify at order if you want this. Replenish your shave kit with the parts that make your shave the best it can be. If you change the WAY you shave - you will get get a new result. 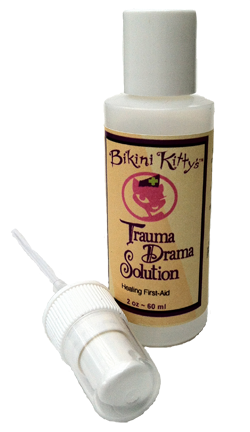 Bikini Kitty has tested and re-tested her methods with many a human volunteers and the results are in; shave the Bikini Kitty way and you will eliminate ingrowns, rash and irritation from your Kitty bits! The most delicate skin is often the skin we abuse the most! 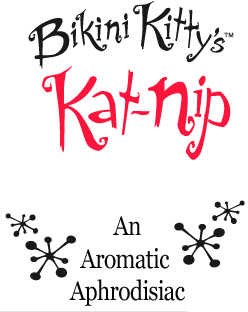 Even the most sensitive of skins will be soothed with the magic in Bikini Kitty's healing, cooling, strengthening solution. Get the red out just after waxing! Heal just shaved skin. Sooth a sunburn - or treat abrasions without alcohol. Kitty has you covered! A fine mist sprayer of natural Aloe base and Witch Hazel cool and sooth. Tea Tree and Organic Lavender speed healing and lend a clean, fresh scent that can disinfect and refresh skin with out alcohol. 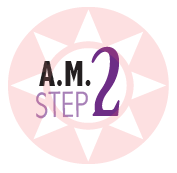 Target delicate skin in the week before hair removal to strengthen it and make it less reactive. Use it post removal to cool, sooth and speed healing and quickly get the RED out... Perfect for lunch time brow waxings. Can be used face & body for any of life's little traumas. Get the satisfaction you desire from a scrub! All of the grit and hydration yet none of the slippery oil that make most scrubs a traction hazard in your tub or shower. Sensitive skins will appreciate the micro- smooth walnut grain - just don't push too hard... Tolerant skins will really dig the exfoliation that stands up to rough, dry parts. Adjust your pressure for just your bits! This lotion based scrub will polish you to perfection. Micro buffed walnut powder does the job without scratching skin. Double Down on this scrub to get the most with the least amount of product or effort! Start with warm, dry hands and polish a small amount of scrub on dry skin, just before your shower. Once in the shower, stay out of the direct spray but do add a bit of water to your skin and scrub once more! Sweet! Do you need to be reminded of that tropical paradise of your dreams? Need to get a little lubrication on your dry, dull, overworked skin? Then this is the tropical treat for you! Pure coconut: two ways! Solid is sweet - but liquid is quicker... Just choose your version and you will be in coconut heaven soon enough. True, pure Coconut - strait from the tropics. Kitty has all the tricks to make your coconuts do their duty well. The Liquid Sunshine version is silky smooth and sprays on quickly and easily with our fine mist sprayer. Anyone in need of a silky slip on just shaved or freshly waxed skin... Put this calming chamomile infused, Talc-free powder 'down-there' - or anywhere. 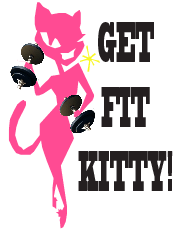 Don't stick to your undies... Don't risk the chance of chaffing on your Kitty bits!! Low dusting means this powder goes where you need it - not all over your bathroom or floor! 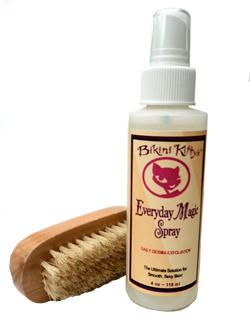 This low dust powder can be dusted on with the Kitty sized puff included in all bare skin areas. Perfect for a 'dry' band-aid on small nicks. Underarms will benefit from its silky slip. Do you see the soap scum on your tub and wonder why it will not rinse away? Sulfates are great detergents, but they tend to stick around (and we use too much and don't rinse well enough). 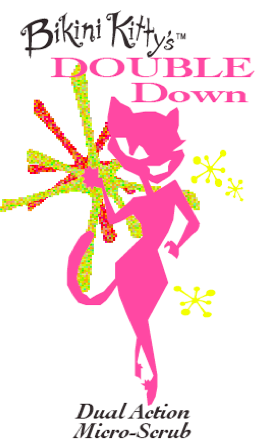 Bikini Kitty will save you from the sulfates and still get you clean! A Sulfate-Free body wash that is the ideal wash to eliminate detergent build-up on body and in hair. Organic Aloe, Lavender and Chamomile will wash away all your cares. The subtle, natural scent from various citrus extracts are enough to perk you up and not overpower. Sweet Blood Orange, Grapefruit and Lemon will brighten your mood while washing all of your Kitty cares away! This is an amazing 3-in-1 wash that can be used for hair, body and tub. The foaming action on this Sulfate-free product will be greatly enhanced with the use of a bath scrunchies or sponge. Can be used as a shampoo, body wash and (low foam) bubble bath. This is what you want if you have 'chicken-skin' on the backs of your arms, sides of your hips or just about anywhere! Sulfate-free body wash and the power duo of Bikini Kitty's exfoliation treatment will get you back to smooth & silky in no time. Invest in a Sulfate-free shampoo if you don't want to use up your wash.
Sulfates can cause residue that makes soap scum in your tub and bumpy 'chicken-skin' on you! Wash with Summer In Seville for a clean, residue free bath or shower and then treat any bumps on legs, back of arms or back with Bikini Kitty's two step exfoliation treatment. This is the shampoo you have been searching for... Bikini Kitty's Brazil Bar Shampoo is the perfect escape from detergent heavy bands your hair and scalp need a vacation from! Bikini Kitty's treat for hair will give your scalp nutrition and your hair relief. All hair types will benefit from a weekly break with a Brazil Bar! Bars make the perfect travel shampoo! Based in the most nurturing ingredients, Bikini Kitty's Brazil Bar Shampoo comes in two formulas - you may need both! 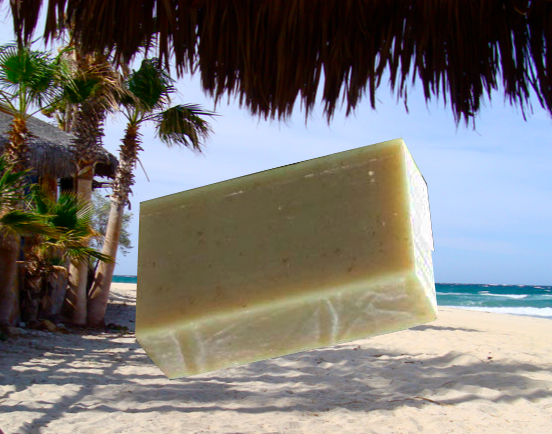 Both bars are based in olive, coconut, castor, shea butter & avocado. I Neem You is infused with Neem oil & enriched with Neem leaves for deep scalp health. Just wet hair, rub with the bar until a lather forms, put the bar aside and scrub as you like. Rinse well. Due to the high castor oil content in the shampoo, Kitty advises that you keep this bar in a dry place between uses. Use your Bikini Kitty Brazil Bar as a once a week break from your regular products - or - you may find you can't live without a little bit of Brazil everyday! Any hair type will love this light weight, deep conditioning hair tonic. The perfect addition to your 'Hair Care Vacation', Bikini Kitty's Silky Free Ride can be used as a weekly treat for over worked hair. Short or long hair. Curly or strait. Thick or fine. Bikini Kitty has the silky, conditioning help your hair is craving! Organic Aloe offers deep, healing hydration with-out weighing down your locks. Castor Seed aids getting this goodness deep into the hair shaft. B5, Wheat protein and Neem oil adds a strengthening treatment that repairs split ends, breakage from styling tools and the stamina to go back for more! This conditioning treatment is so light it comes in a spray bottle! Just spritz onto damp hair and style as usual. Deeper conditioning can be had from a full saturation with the product and then letting hair rest, wrapped in a damp towel for 20 to 30 minutes. This fantastic, leave-in conditioner can be used once a day - or once a week... Let your hair decide! 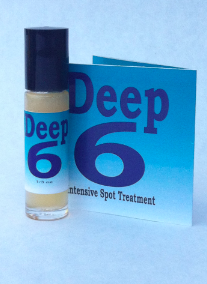 Any spot you see fit to get rid of will benefit from the six tricks in Deep Six: Acne, Ingrowns, Scars as well as UV damaged ares (Sun/Age) spots. A convenient roller-ball glass bottle applicator puts the magic right where you need it. Equal parts of Glycolic Acid, WillowBark and Organic Rooibos Extract are blended with the expert delivery of Castor Oil and then topped off with Lavender and Tea Tree Oil. Shake your bottle to full incorporate all six ingredients and then apply to clean, dry skin up to 4 times a day.